2. Mix paneer, cornflour, salt and chilli powder in a bowl. 3. Mix well and form into balls with crushed almonds. 4. Fry till golden brown. 5. Keep only 1 1/2 tblsp of oil in the pan and transfer the rest to a bowl. 6. Add cardamoms and dry red chillies to the pan. 8. Add salt, turmeric powder, red chilli powder, ginger paste, garlic paste with 1/8 to 1/4 cup of water. 10. Add curd and tomato puree. 12. Add 1 to 2 cups of water and cook till the gravy is thick. 14. Garnish with cream and serve with rotis, naans and rice. 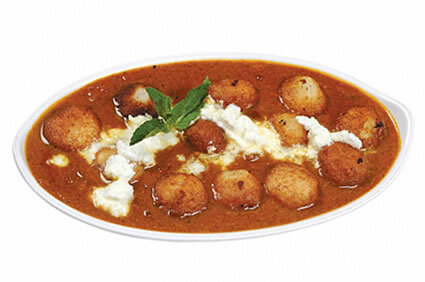 Feel free to comment or share your thoughts on this Cheese Koftas Recipe from Awesome Cuisine.